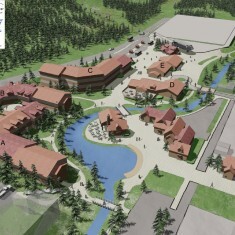 Breckenridge | Breckenridge | Ecosign Mountain Resort Planners Ltd. 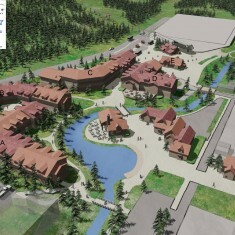 Client Vail Resorts Development Co. 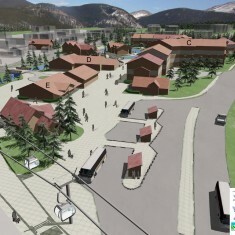 The Breck Connect gondola links the skier parking lots in the valley to the Peak 8 ski base, replacing an outdated shuttle bus system. 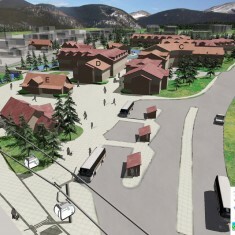 Ecosign prepared a master plan to link the gondola plaza and Breckenridge’s historic downtown through the creation of a new pedestrian neighborhood. The study area encompassed lands owned by the Town of Breckenridge and Vail Resorts. Our challenge was to extend the character of the historic district into the development and create an interesting pedestrian environment that will encourage day visitors to linger in Breckenridge. 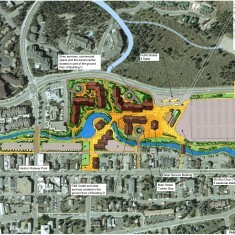 The master plan incorporated an extension of the Blue River Riverwalk with a feature park, connections to Main Street, the local and regional bus transit hub, public amenity space and skier services.